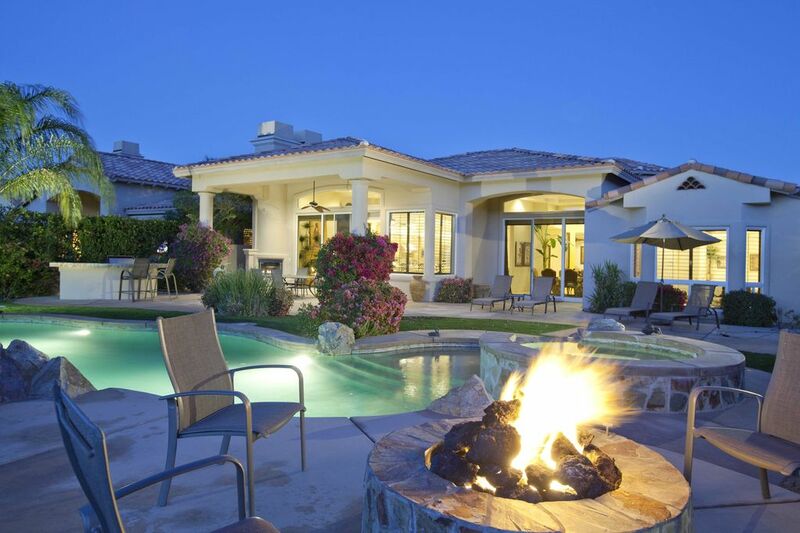 This beautiful home has the largest floor plan in Rancho La Quinta. As you enter the home, you'll walk through a chandeliered rotunda into a beautiful room with big screen TV and entertainment unit with comfortable and luxurious furnishings. The dining room has a beautiful view of the pool, golf course and mountains. The gourmet kitchen has granite counter tops, a kitchen island, stainless steel appliances and everything you need (other than groceries!) to whip up a quick snack or to prepare a gourmet dinner. For business, there is an office with wireless internet connection. For play, there is a sunken bar to make cocktails. The bedrooms are nicely appointed with TVs in all but one rooms, and bathrooms in each room. The casita is a single bedroom guest house with a front courtyard separate entrance. And, of course, there is a fabulous free-form pool, spa and waterfall. And to top it off, a built in barbecue, fire pit and lovely patio furniture for those cool nights entertaining out back. The home has 4 bedrooms including a separate 1 bedroom casita, 4.5 baths, study, and 4500 sq ft of living space. What a wonderful home, everything was a lot prettier than the pictures. Right on hole number 12 on the jones course at Rancho Laquntia. We cooked in a couple of times and the grill and others things was teriffic And amazing swiminging pool and a lovely hot tub, and if that is not enough the home has a lovely gas fire pit.Dixie and Emmy was very easy to work with and her on site host Mavis was helpful via the phone. If you can rent this home you cannot go wrong. We will be back Miss Dixie. Always enjoy our holidays in this beautiful home. Owner and assistant are great to work with. My husband and I loved staying at this gorgeous home. The location was perfect for all the activities, restaurants and golf in the Palm Springs area. I would put it at the top of our favorite homes we have rented through VRBO. This is my 4th time staying at this location. It is VERY spacious and the pictures do not do it any justice. The bedrooms all have sizable closets, ensuites, and TV's (except for one of the rooms). Master has king size bed, Casita has a queen, remaining 2 have full size beds. The house is fully equipped with everything that you would need including: towels, beach towels, serving/cooking/tupperwaer, gas grill, books, detergents, soaps, etc. It's a quick easy drive to the grocery stores (Ralph's is 3 minutes away and Costco is 2 miles away). The pool is great for all family members because I started staying there when my kids were as young as 18 months (now 7 years old). There is a shallow end for tanning and also a great place for the kids to play in the water safely. The gardener and pool guy comes midweek. I would recommend bug spray and a citronella candles as the bugs and flies do come out during the warmer months. My family looks forward to our annual vacation in La Quinta. Thanks for everything, Dixie! Thank you! We are so glad you enjoyed your stay! My family enjoyed staying at this beautiful home. Morgan and Dixie were great to work with and the property manager was very friendly and always prompt at answering any of our questions. We love all the amenities of RLQ and we will definitely be coming back to this amazing home. Enjoyed our stay in this beautiful, well laid out home. Kitchen was well stocked with spices and plenty of cooking utensils, if you plan on cooking. Pool and spa were beautiful, spent most of our time outside. House was very clean and Norma, the property manager was very helpful. The description is accurate and the pics do not do it justice. We'll stay again for sure! Thank You for the feedback Kathy! We look working with you again!